Factor associated with neutral sphingomyelinase activation (FAN) is an adaptor protein that constitutively binds to TNF-R1. Microarray analysis was performed in fibroblasts derived from wild-type or FAN knockout mouse embryos to evaluate the role of FAN in TNF-induced gene expression. 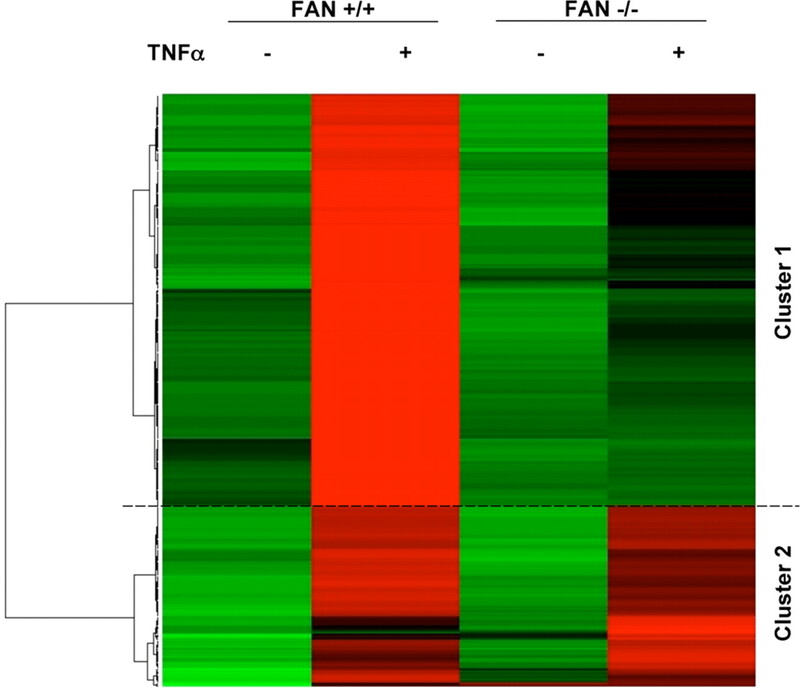 Approximately 70% of TNF-induced genes exhibited lower expression levels in FAN-deficient than in wild-type fibroblasts. Of particular interest, TNF-induced expression of cytokines/chemokines, such as IL-6 and CXCL-2, was impaired in FAN-deficient cells. This was confirmed by real time RT-PCR and ELISA. Upon i.p. TNF or thioglycollate injection, neutrophil recruitment into the peritoneal cavity was reduced by more than 50% in FAN-deficient mice. Nevertheless, FAN-deficient animals did not exhibit an increased susceptibility to different microorganisms including bacteria and parasites, indicating that FAN is not essential for pathogen clearance. Specific Ab response to BSA was substantially impaired in FAN-deficient mice and this was associated with a reduced content of leukocytes in the spleen of BSA-challenged FAN-deficient mice as compared with their wild-type counterparts. Altogether, our results indicate the involvement of FAN in TNF-induced gene expression and leukocyte recruitment, contributing to the establishment of the specific immune response. Inflammation is a highly regulated physiological response to a variety of aggressions, such as infections, aiming at eliminating pathogens through complex molecular and cellular mechanisms. Excess inflammation is involved in different pathological conditions, including autoimmune and cardiovascular diseases and cancer. TNF-α plays a pivotal role in inflammatory responses involved in both innate and specific immune responses. TNF-α is also involved in autoimmune diseases and anti-TNF therapy is efficient for the treatment of rheumatoid arthritis, Crohn disease, multiple sclerosis, and psoriasis. A higher susceptibility to infections has been noticed in many patients treated by TNF-neutralizing molecules, highlighting the crucial function of TNF in the anti-infectious response (for reviews, see Refs. 1, 2, 3, 4). Most of the biological effects triggered by TNF, including inflammatory responses, are mediated by TNF-R1 (CD120a) (1). TNF-R1 contains a death domain that recruits different adaptor proteins such as TNF-R1-associated protein with death domain (TRADD)3 and TNF-R1-associated factor 2 allowing NF-κB activation through a receptor-interacting protein-dependent pathway (5, 6). NF-κB, together with other transcription factors such as AP-1, activates the expression of genes encoding cytokines, chemokines, and adhesion molecules involved in leukocyte recruitment, maturation, and activation, which contribute to the development of inflammatory and immune responses (4, 7). Moreover, TRADD interacts with Fas-associated death domain protein, which activates the caspase cascade, leading to apoptosis (8). A specific, membrane-proximal domain of TNF-R1, called NSD (neutral sphingomyelinase domain) was identified by Adam et al. (9). NSD is required for TNF-induced neutral sphingomyelinase activation (9) and constitutively interacts with the adaptor protein FAN (factor associated with neutral sphingomyelinase activation) (10). Moreover, FAN physically and functionally interacts with two other receptors, CD40 (11) and cannabinoid type 1 receptor (12). FAN is involved in neutral sphingomyelinase activation and ceramide production in response to TNF, CD40L, and Δ9-tetrahydrocannabinol (10, 11, 12). FAN contains five WD-repeat sequences at its C terminus, which interact with NSD and RACK1. The FAN N terminus possesses beige and Chediak-Higashi and plekstrin homology domains, which are both required for TNF-induced neutral sphingomyelinase activation (10, 13, 14). Recently, the plekstrin homology domain of FAN has been shown to specifically interact with phosphatidylinositol-4,5-bis phosphate, allowing localization at the plasma membrane (15). So far, the biological role of FAN has been evaluated mainly by analyzing the impact of the expression of a truncated dominant-negative FAN (FAN DN), the response of FAN-deficient cells derived from FAN knockout mice, and the phenotype of FAN-deficient mice. FAN DN expression in SV40-transformed human fibroblasts (16) and in rat hepatoma cells (17) inhibited caspase activation and apoptosis in response to TNF. TNF-induced caspase activation and apoptosis were also significantly impaired in mouse embryonic fibroblasts (MEFs) derived from FAN-deficient embryos as compared with their wild-type counterparts (16). CD40L-triggered apoptosis was inhibited in SV40-transformed human fibroblasts expressing FAN DN as well as in FAN-deficient MEFs (11). Ischemia/reperfusion-induced apoptosis was abrogated in rat neonatal cardiomyocytes expressing FAN DN (18). Moreover, two studies indicate a putative link between FAN and the lysosome compartment. First, FAN has been shown to be required in TNF-mediated caspase-dependent lysosomal membrane permeabilization, leading to cathepsin-B release from lysosome to cytosol (17). Second, FAN-deficient MEFs displayed a significant increase in lysosome size (19). Furthermore, FAN likely contributes to inflammation. Indeed, we have previously provided evidence for a role of FAN in TNF- and LPS-triggered IL-6 secretion in fibroblasts and macrophages (20). In addition, FAN-deficient mice partially resisted TNF- and LPS-induced fulminant hepatitis and this was associated with reduced IL-6 secretion, indicating a putative function of FAN in inflammatory response in vivo (20). FAN has been described to be implicated in TNF-mediated cdc42 (cell division cycle 42) activation and actin reorganisation leading to filopodia formation (15). The latter study may indicate an important function of FAN in TNF-induced cell motility, an essential biological process in epidermal repair, wound healing, and inflammation. As a matter of fact, FAN-deficient mice display a delayed recovery after cutaneous barrier disruption, suggesting the involvement of FAN in epidermal barrier repair (21). More recently, the absence of sickness behavior in FAN-deficient mice intracerebroventricularly injected with TNF highlights the essential role of FAN in the TNF-mediated central action (22). Nevertheless, the biological functions of FAN in TNF-induced inflammatory response still remain to be clarified. In this paper, we provide evidence that FAN selectively participates in TNF-induced gene expression by leading to the production of some cytokines and chemokines. Accordingly, leukocyte recruitment, notably in response to TNF, and the specific humoral response to BSA were impaired in FAN-deficient mice. Recombinant human and mouse TNF-α were purchased from PeproTech. Mouse CXCL-2, as well as MCP-1 and IL-6, were quantified by ELISA using match-paired Abs purchased from R&D Systems and BD Biosciences, respectively. Anti-BSA Abs were measured by ELISA in 96-well plates coated with 2 μg/ml BSA (Sigma-Aldrich) and using biotin-coupled anti-mouse IgM, anti-mouse IgG2a, and anti-mouse IgG1 Abs (BD Biosciences). Revelation was performed using peroxidase-coupled avidin (BD Biosciences). Alternatively, peroxidase-conjugated anti-mouse Ab (DakoCytomation) was used. ELISAs were performed following the manufacturer’s instructions. Spleen cells were analyzed by flow cytometry after labeling with PE-coupled anti-mouse CD3, FITC-coupled anti-mouse CD19 (Immunotech), FITC-coupled anti-mouse MHC class II, allophycocyanin-coupled anti-mouse CD11b, PE-coupled anti-mouse F4/80, and PE-coupled anti-mouse Gr1 (BD Biosciences) Abs. PMA was purchased from Sigma-Aldrich. C57BL/6 FAN+/− embryos, provided by Drs. S. Adam and M. Krönke (University of Kiel, Kiel, Germany), were implanted in C57BL/6 females to get heterozygous (FAN+/−) mice. Wild-type mice (herein referred to as FAN+/+) and FAN-deficient (FAN−/−) mice were then obtained by mating the heterozygous mice. The FAN+/+ mice obtained from heterozygous breeding pairs served as controls. TNF-α-deficient (TNF−/−) mice were a gift from Dr. J. F. Arnal (Inserm U858, Toulouse, France). Mice were housed in temperature-controlled rooms in the specific pathogen-free animal facility of IFR31, Toulouse, France, kept on a 12-h light/dark cycle, and had unrestricted access to food and water. All animal studies were conducted according to national and international policies and were approved by the local committee for animal experimentation. MEFs were generated from C57BL/6 FAN+/+ or FAN−/− mice. After decapitation and removal of liver and limbs, embryos were dilacerated and trypsinized and adherent cells were cultured in DMEM 10% FCS (Invitrogen). Three MEF cell lines were generated for each group. MEFs derived from TNF-R1 and TNF-R2 double-deficient mice and expressing either wild-type or NSD-deleted human TNF-R1 were provided by Dr. S. Schütze (University of Kiel, Kiel, Germany) (23). Mice were i.p. injected with 100 ng human TNF-α or 1 ml of 4% thioglycollate (Sigma-Aldrich) in PBS. At the indicated times, mice were killed by cervical dislocation. Leukocytes from the peritoneal cavity were collected by PBS washes. RBC were lysed in lysis buffer containing 0.15 M NH4Cl, 1 mM KHCO3, 0.1 mM EDTA, pH 7.2. Total leukocytes were quantified by Coulter counter. Leukocytes were labeled with the indicated Abs for 30 min at 4°C and analyzed by flow cytometry (FACSCalibur; BD Biosciences) using Cell Quest Pro Software (BD Biosciences). Absolute numbers were calculated by multiplying cell percentages (as evaluated by flow cytometry) with total leukocyte numbers (as determined by Coulter). Mice were killed and the peritoneal cavity was washed with 1 ml PBS. The liquid from the peritoneal cavity was immediately collected and centrifuged at 300 × g. Cytokines present in the supernatants were quantified by ELISA. Blood was collected by retro-orbital puncture on heparin and analyzed by cytometry (Beckman Coulter). Alternatively, blood cells were stained with May-Grünwald Giemsa and analyzed by microscopy. Similar data were obtained with both methods. Mice were i.p. injected with 10 cysts Toxoplasma gondii (Beverley strain). Cysts of Toxoplasma gondii were obtained from the brains of orally infected female Swiss mice (Janvier) maintained by passage every 6 mo in our laboratory (24). Alternatively, mice were i.p. injected with 104 colony-forming units Listeria monocytogenes (CIP 54149; Pasteur Institute) or 104 colony-forming units Streptococcus pneumoniae (23477, serotype 6B) (25) and survival was monitored daily. Mice were i.p. injected with 100 μg BSA emulsified in CFA (Sigma-Aldrich), followed by two BSA injections in incomplete Freund’s adjuvant (IFA; Sigma-Aldrich) at days 7 and 14. Mice were anesthetized with fluothane inhalation and ∼100 μl of blood was collected by retro-orbital puncture. Anti-BSA Abs were measured by ELISA at days 13 and 21. Alternatively, mice were injected with a single BSA injection in CFA and anti-BSA Abs were evaluated 10 days postinjection. Gene expression was analyzed by Affymetrix GeneChip Mouse Genome 430 2.0 Array (Affymetrix) in FAN+/+ and FAN−/− MEFs that were incubated in the presence or absence of 50 ng/ml human TNF-α for 16 h. The four data sets were normalized using the Robust MultiArray method available from BioConductor in R. The data have been deposited in the National Center for Biotechnology Information’s Gene Expression Omnibus (26) and are accessible through GEO Series accession number GSE12275 (http://www.ncbi.nlm.nih.gov/geo/query/acc.cgi?acc=GSE12275). The ratio of TNF induction in wild-type cells was calculated and 289 probes with at least a 1.5 log-ratio were selected for statistical analysis. Samples and selected genes were clustered by hierarchical clustering (distance: 1-Pearson correlation coefficient) and represented as a heat map (R software with packages from BioConductor). Two gene clusters were defined and analyzed using Ingenuity Pathway Analysis (Ingenuity Systems) to identify the biological functions that were most significant to each cluster. RNA extraction was performed using RNA STAT-60 (Ams Biotechnology). cDNA was obtained using 1 μg of total RNA for reverse transcription and the Superscript II Reverse Transcriptase (Invitrogen). Real-time quantitative PCR was conducted using primers for CXCL-2, IL-6, MCP-1, VCAM-1, ICAM-1, and GAPDH (Qiagen), and with Power SYBR Green PCR Master Mix (Applied Biosystems) in an ABI 7900 analyser (Applied Biosystems). Cytokine mRNA levels were calculated as previously described (27) using GAPDH mRNA to normalize gene expression. Results are expressed as means ± SEM of at least three independent determinations. Mean values were compared using the Student’s t test. Differences were considered statistically significant when p < 0.05. To clarify the role of FAN in TNF-R1 signaling, we initially evaluated the impact of FAN deficiency on TNF-induced gene expression in MEFs. Subconfluent MEFs derived from either FAN+/+ or FAN−/− mice were cultured under serum-free conditions for 16 h in the presence or absence of 50 ng/ml human TNF that binds murine TNF-R1 but not TNF-R2 (7). No toxicity was observed in response to TNF in this experimental setting, as evaluated by MTT assay and morphological analysis (data not shown). Microarray analysis of ∼21,000 genes indicated a 2.8-fold or more up-regulation of 289 probe sets corresponding to ∼200 genes upon TNF treatment in FAN+/+ MEFs as compared with untreated cells. Hierarchical clustering was performed on the up-regulated genes to compare TNF-induced gene expression in FAN+/+ and FAN−/− cells (Fig. 1⇓). Genes were divided into two clusters: cluster 1 included 201 probe sets that were up-regulated in FAN+/+ MEFs and, to a lesser extent, in FAN−/− MEFs; cluster 2 included 88 probe sets that were similarly up-regulated in FAN+/+ and FAN−/− MEFs (Fig. 1⇓). Thus, under our experimental conditions, FAN is somewhat involved in TNF-induced gene expression of ∼70% of genes (those from cluster 1). Interestingly, cluster 1 included genes encoding inflammatory proteins such as the CXCL-2 chemokine (chemoattractant toward neutrophils) and the VCAM-1 adhesion molecule (Table I⇓). Moreover, IL-6 was also included in this cluster in agreement with our previous study showing the role of FAN in TNF-mediated IL-6 secretion (20). Cluster 2 contained a different set of genes encoding inflammatory proteins such as the MCP-1/CCL-2 chemokine (chemoattractant toward macrophages) and the adhesion molecule ICAM-1 (Table I⇓), in agreement with our previous study showing that TNF triggered ICAM-1 protein expression on the cell surface in a FAN-independent manner (16). Involvement of FAN in TNF-induced gene expression. MEFs derived from FAN+/+ and FAN−/− embryos were incubated for 16 h in the presence or absence of 50 ng/ml human TNF-α. Gene expression was analyzed by microarray and genes whose expression was up-regulated by at least 2.8-fold in response to TNF were hierarchically clustered. Two main clusters were defined: cluster 1 consists of genes that are less responsive to TNF in FAN−/− MEFs; cluster 2 contains genes that were similarly up-regulated in both FAN+/+ and FAN−/− MEFs. Clusters 1 and 2 were further analyzed by Ingenuity Pathways Analysis (IPA; Ingenuity Systems) to establish the main sub-networks associated with each gene cluster, focusing on genes encoding proteins involved in the modulation of immune and inflammatory responses. For cluster 1, the main functions associated with the sub-network are Ag presentation and cell-mediated and humoral immune responses (data not shown). For instance, some genes encoding MHC proteins and proteins involved in the regulation of Ag presentation, such as transporters associated with Ag-processing binding protein and the CD74 Ag, belong to cluster 1. Interestingly, IL-6 seems to be directly or indirectly connected to most of the genes presented in this sub-network (data not shown). For cluster 2, the main functions associated with the sub-network are development and function of the hematological system and inflammatory response (data not shown). Gene expression was next analyzed by real-time RT-PCR and ELISA. These experiments were conducted using three different MEF populations of each genotype to rule out the possibility that differences observed in microarray analysis might be due to the use of single FAN+/+ and FAN−/− cells. In accordance with the microarray data, TNF-induced IL-6 and CXCL-2, but not MCP-1 and ICAM-1, expression was significantly reduced in FAN−/− MEFs as compared with their wild-type counterparts (Table II⇓). Whereas TNF triggered VCAM-1 expression to a lesser extent in FAN−/− MEFs than in FAN+/+ MEFs, differences did not reach statistical significance. Also, secretion of CXCL-2 and IL-6, but not MCP-1, was decreased in TNF-treated FAN−/− MEFs (Fig. 2⇓A). FAN is involved in TNF-induced expression of CXCL-2 and IL-6 but not MCP-1. A and B, MEFs derived from FAN+/+ and FAN−/− mice were incubated for 16 h in the presence or absence of the indicated concentrations of human TNF-α (hTNF) or 200 nM PMA, which was solubilized in DMSO (vehicle). Cytokine secretion into the cell culture medium was evaluated by ELISA. Data are means ± SEM of three to four independent experiments conducted on MEFs derived from three different embryos of each genotype. C, MEFs derived from TNF-R1 and TNF-R2 double knockout embryos (TNFR KO) and expressing either wild-type (TNF-R1) or NSD-deleted TNF-R1 (ΔNSD) were incubated for 16 h in the presence or absence of 50 ng/ml human TNF-α. CXCL-2 and MCP-1 secretion into cell culture medium was measured by ELISA. Data are means ± SEM of three independent experiments. ∗, p < 0.05. To further evaluate the selective function of FAN in TNF-induced cytokine secretion, new MEFs derived from FAN+/+ or FAN−/− mice were freshly prepared and incubated in the presence of increasing human TNF-α concentrations (1–25 ng/ml). As illustrated in Fig. 2⇑B, wild-type MEFs secreted IL-6, CXCL-2, and MCP-1 in a dose-dependent manner. Whereas TNF-induced MCP-1 secretion was unaffected by FAN deficiency, IL-6 and CXCL-2 secretion was strongly impaired at all TNF concentrations tested (Fig. 2⇑B). Similarly, IL-6 secretion, but not that of MCP-1, was significantly impaired in FAN−/− MEFs in response to mouse TNF-α (data not shown). The latter finding indicates that TNF-R2 signaling cannot compensate for the observed defects in TNF-R1 signaling caused by FAN deficiency. Finally, cells were incubated in the presence of PMA, which triggers protein kinase C activation and translocation to the plasma membrane similarly in FAN+/+ and FAN−/− MEFs (19). Under our experimental conditions, PMA triggered IL-6, MCP-1, and, to a lesser extent, CXCL-2 secretion (Fig. 2⇑B). PMA-induced cytokine secretion was unaffected by FAN deficiency (Fig. 2⇑B), indicating that FAN−/− MEFs produce normal levels of proinflammatory cytokines in response to a FAN-independent stimulus. To further evaluate the role of FAN in TNF-induced chemokine expression, we investigated the impact of the deletion of the FAN binding domain (i.e., NSD) in TNF-R1. For this purpose, we analyzed the responses of MEFs derived from TNF-R1 and TNF-R2 double-knockout mice, which express either wild-type or NSD-deleted human TNF-R1 (23). Whereas cells expressing wild-type TNF-R1 produced both MCP-1 and CXCL-2 in response to TNF, cells expressing the NSD truncated receptor only significantly secreted MCP-1 (Fig. 2⇑C). Collectively, microarray, real-time PCR, and ELISA analyses indicated a selective function of FAN in TNF-induced gene expression, effecting genes encoding cytokines and chemokines such as IL-6 and CXCL-2. Because the transcription factor NF-κB plays a critical role in the expression of proinflammatory genes, we next evaluated the role of FAN in TNF-induced NF-κB translocation to the nucleus by gel shift (data not shown). NF-κB was activated with similar kinetics in FAN+/+ and FAN−/− MEFs (peaking at 15 min) and was not significantly altered by FAN deficiency (data not shown). These data are in agreement with our previous observation showing that expression of a dominant-negative form of FAN in human fibroblasts did not impair TNF-induced NF-κB translocation to the nucleus (16). Accordingly, the expression of some NF-κB-dependent genes, such as those encoding MCP-1 and ICAM-1, was not significantly altered in FAN−/− MEFs (Fig. 2⇑ and Tables I⇑ and II⇑). However, we cannot rule out the possibility that FAN is implicated in the optimal transcriptional activity of NF-κB for other NF-κB-dependent genes, including those encoding IL-6 and VCAM-1. To evaluate the function of FAN in leukocyte recruitment to inflammatory sites, FAN+/+ and FAN−/− mice were i.p. injected with human TNF and the leukocytes isolated from the peritoneal cavity were analyzed by flow cytometry at 4 and 48 h postinjection. Neutrophil (CD11b+ Gr-1+) content strongly and transiently increased 4 h following TNF administration in both FAN+/+ and FAN−/− mice (Fig. 3⇓A). Nevertheless, neutrophil recruitment was decreased by 70% within the peritoneal cavity in FAN−/− mice as compared with FAN+/+ counterparts (Fig. 3⇓A). Macrophages (CD11b+ F4/80+) were recruited later and absolute numbers were significantly higher at 48 h in both groups when compared with noninjected mice (Fig. 3⇓B). Whereas macrophages were recruited to a lesser extent in FAN−/− mice than in FAN+/+ mice, differences did not reach statistical significance. Cytokines were next measured in peritoneal fluids at the peak of neutrophil recruitment (i.e., 4 h postinjection). TNF induced MCP-1 and, to a lesser extent, IL-6 and CXCL-2 secretion into the peritoneal cavity of FAN+/+ and FAN−/− mice (Fig. 3⇓C). Whereas MCP-1 was equally secreted by both mouse strains, CXCL-2 levels were significantly lower in FAN−/− mice (Fig. 3⇓C). Moreover, IL-6 concentration was lower in the peritoneal cavity of FAN−/− mice as compared with FAN+/+ mice, yet differences did not reach statistical significance (Fig. 3⇓C). FAN is involved in TNF-induced neutrophil recruitment. FAN+/+ (black bars) and FAN−/− (white bars) mice were i.p. injected or not (None) with 100 ng human TNF-α. Four and 48 h later, mice were killed and peritoneal leukocyte contents were analyzed by flow cytometry after labeling with anti-CD11b-allophycocyanin associated either with anti-Gr1-PE (A) or anti-F4/80-PE (B). Data are means ± SEM of values obtained in six mice from each group and are representative of two independent experiments. C, Alternatively, 4 h post-TNF injection, mice were killed and peritoneal fluids were collected by injecting 1 ml PBS into the peritoneal cavity. Cells were removed by centrifugation and cytokines were quantified into the supernatants by ELISA. Data are means ± SEM of values obtained in four different mice from each group. ∗, p < 0.05. In addition, we evaluated the impact of FAN deficiency on leukocyte recruitment elicited by i.p. injection of thioglycollate, a widely used proinflammatory compound. Under our experimental conditions, neutrophil recruitment elicited by thioglycollate was maximal at 24 h (data not shown), in agreement with previous reports (28, 29). 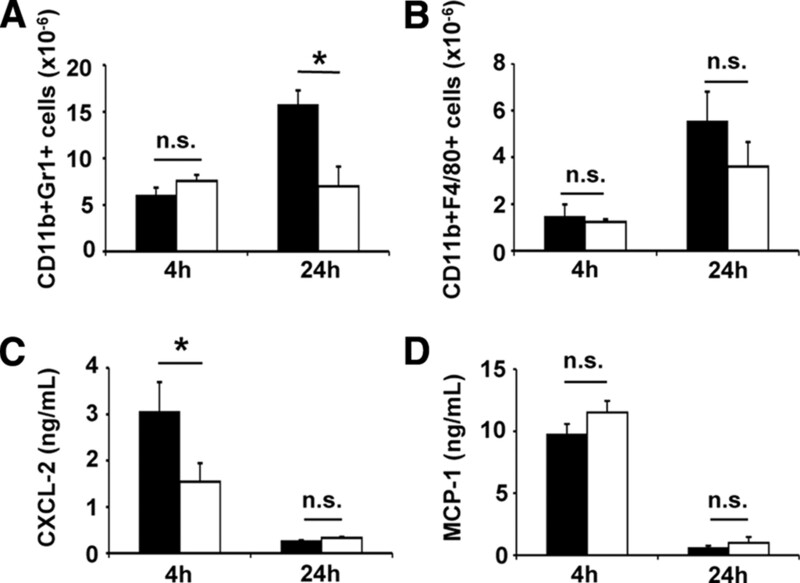 Thioglycollate triggered a time-dependent neutrophil and macrophage recruitment in both groups, albeit to a lesser extent in FAN−/− mice, at 24 h (Figs. 4⇓, A and B). Whereas leukocyte recruitment at 4 h was unaltered by FAN deficiency, neutrophils (Fig. 4⇓A), but not macrophages (Fig. 4⇓B), were significantly less abundant in the peritoneal cavity of FAN−/− mice 24 h after thioglycollate injection. Cytokine secretion was next evaluated under the same experimental conditions. Thioglycollate elicited an early and transient CXCL-2 (Fig. 4⇓C) and MCP-1 (Fig. 4⇓D) secretion. Whereas MCP-1 secretion was not affected by FAN deficiency (Fig. 4⇓D), CXCL-2 secretion was significantly reduced at 4 h into the peritoneal cavity of FAN−/− mice as compared with their FAN+/+ counterparts (Fig. 4⇓C). FAN is involved in thioglycollate-induced CXCL-2 secretion and neutrophil recruitment. FAN+/+ (black bars) and FAN−/− (white bars) mice were i.p. injected with 1 ml of 4% thioglycollate in PBS. Four and 24 h later, mice were killed and peritoneal leukocytes were quantified by Coulter counter and analyzed by flow cytometry after labeling with anti-CD11b-allophycocyanin associated either with anti-Gr1-PE (A) or anti-F4/80-PE (B). Alternatively, CXCL-2 (C) and MCP-1 (D) into the peritoneal fluids were quantified 4 and 24 h postinjection by ELISA. Data are means ± SEM of values obtained from two independent experiments performed on 8–10 mice from each group. ∗, p < 0.05. n.s., Not significant. Collectively, our data uncovered an unprecedented selective role of FAN in cytokine production and leukocyte recruitment in two different models of acute peritonitis. TNF plays a critical role in host resistance against various pathogens, particularly intracellular microorganisms, as illustrated by the high susceptibility to infection of TNF- or TNFR1-deficient mice and patients treated with TNF-neutralizing agents (4, 30, 31, 32, 33). To evaluate the function of FAN in the anti-infectious responses, FAN+/+ and FAN−/− mice were challenged with Toxoplasma gondii (Fig. 5⇓A), Listeria monocytogenes (Fig. 5⇓B), and Streptococcus pneumoniae (Fig. 5⇓C). TNF-deficient mice, used as a positive control, rapidly died within a few days postinfection in all protocols. In sharp contrast, none of the FAN+/+ and FAN−/− mice succumbed to toxoplasma (Fig. 5⇓A) or listeria (Fig. 5⇓B) infections. Moreover, parasitemia (as evaluated by PCR) brain toxoplasma cyst formation (as determined microscopically), as well as spleen and liver Listeria contents (as evaluated on blood agar) did not significantly differ in FAN+/+ and FAN−/− mice (data not shown). When mice were injected with Streptococcus pneumoniae, comparable mortality was observed in both groups (Fig. 5⇓C). Altogether, our data indicate that FAN does not play a crucial role in parasite and bacteria clearance. Mice survival after parasite and bacterial infections. FAN+/+, FAN−/−, and TNF−/− mice were infected with Toxoplasma gondii (A), Listeria monocytogenes (B), and Streptococcus pneumoniae (C) and survival was monitored up to 40, 10, and 7 days, respectively. The number of mice studied is shown within each plot. TNF has been shown to participate in specific immune responses, such as the humoral response to thymo-dependent Ags, mostly through activation of the TNFR1-dependent signaling pathway activation (34, 35, 36). The function of FAN in humoral responses toward complex Ags was next analyzed. FAN deficiency did not impair the humoral response toward trinitrophenyl-LPS, a thymo-independent Ag (data not shown), as observed in TNF-deficient mice (36), indicating that B cell functions are not drastically impaired in FAN−/− mice. FAN+/+, FAN−/−, and TNF−/− mice were next challenged with two or three repeated injections of BSA, a thymo-dependent Ag. BSA was emulsified in CFA for the first injection and in IFA for the second and third injections. Specific anti-BSA Abs were time-dependently produced and increased upon the third injection in the three groups, albeit to a lesser extent in FAN−/− and TNF−/− mice (Fig. 6⇓A). Thus, our results are in agreement with previous reports showing a role for TNF in Ab production toward a thymo-dependent Ag (34, 35, 36) and indicate the involvement of FAN in this process. The humoral response was analyzed in more details in FAN+/+ and FAN−/− mice upon one or three repeated BSA injections to evaluate the primary and secondary responses, respectively. Anti-BSA IgM production occurred mainly during the primary response for both groups, albeit to a lesser extent in FAN−/− mice. 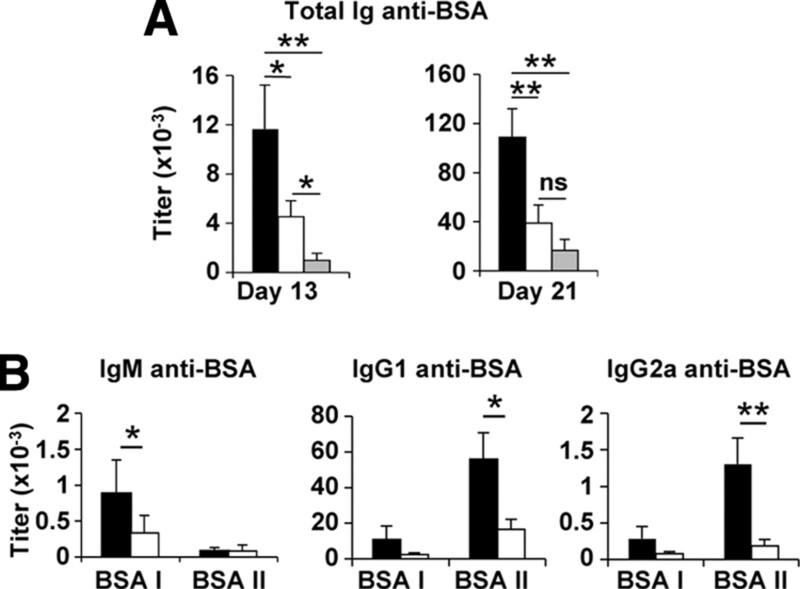 Anti-BSA IgG1 and IgG2a Ab production increased upon repeated injections and was considerably reduced in FAN−/− mice as compared with FAN+/+ animals (Fig. 6⇓B). Humoral response to a thymo-dependent Ag. A, FAN+/+ (black bars), FAN−/− (white bars), and TNF−/− (gray bars) mice were injected with BSA emulsified in CFA followed by two BSA injections in IFA at days 7 and 14. Total anti-BSA Abs were quantified by ELISA at days 13 and 21. B, FAN+/+ (black bars) and FAN−/− (white bars) mice were injected with BSA emulsified in CFA (BSA I) or as described in A (BSA II), and anti-BSA Abs were quantified by ELISA at days 10 and 21, respectively. Data are means ± SEM of 5 to 10 determinations. ∗, p < 0.05; ∗∗, p < 0.01. Spleen and blood leukocyte composition was next analyzed before and after BSA injections in FAN+/+ and FAN−/− mice. Leukocyte contents were similar in both groups before immunization (Fig. 7⇓). 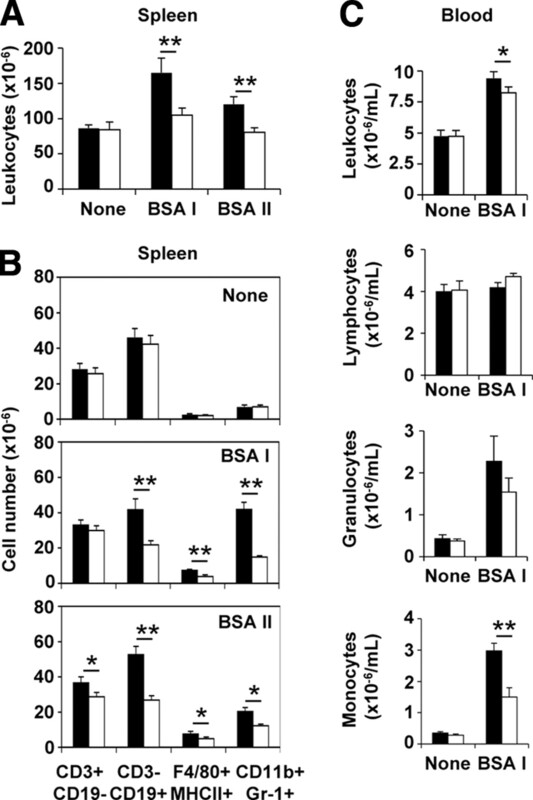 Upon immunization, an increase of total spleen cell number occurred in FAN+/+ mice, mainly during the primary response when BSA was injected in CFA, whereas no or little increase of spleen leukocyte content was seen in FAN−/− mice (Fig. 7⇓A). Spleen lymphoid cells (CD3+ cells and CD19+ cells) as well as myeloid cells such as macrophages (F4/80+ MHC-II+ cells) and neutrophils (CD11b+ Gr1+ cells) were reduced in FAN−/− mice upon immunization (Fig. 7⇓B). 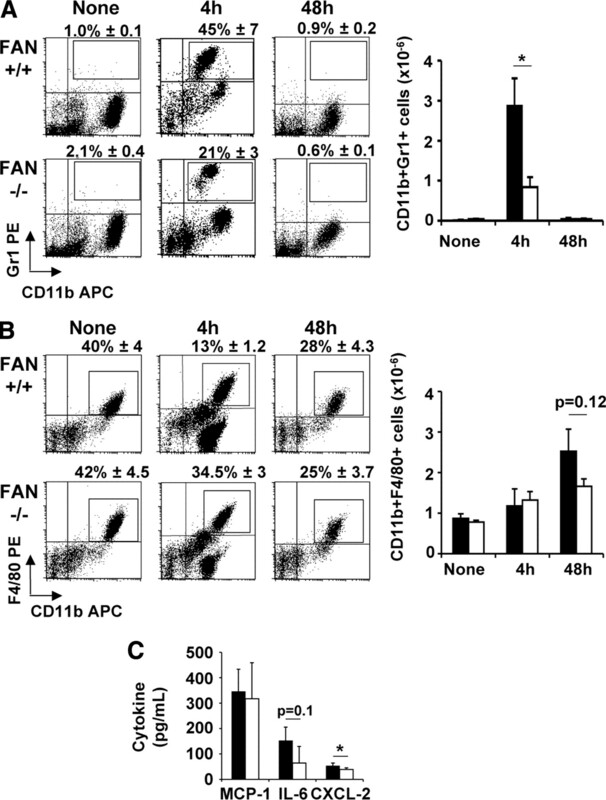 Also, spleen dendritic cell content (CD11b+ CD11c+ cells) was decreased in immunized FAN−/− mice (data not shown). Although blood leukocyte content increased in both groups (Fig. 7⇓C), blood monocytes, but not lymphocytes or granulocytes, were less abundant in FAN−/− mice (Fig. 7⇓C). Blood and spleen leukocyte population in FAN+/+ and FAN−/− mice. FAN+/+ (black bars) and FAN−/− (white bars) mice were injected with BSA as described in the legend to Fig. 6. A, Total spleen leukocytes were counted using a Coulter counter in noninjected (None) mice and in mice injected with BSA once (BSA I) or three times (BSA II). B, Spleen cells were labeled with a mix of anti-CD3 and anti-CD19, a mix of anti-F4/80 and anti-MHC class II, or a mix of anti-Gr1 and anti-CD11b and analyzed by flow cytometry. Absolute numbers were calculated by multiplying percentages of the different cell populations with total spleen number. C, Blood leukocytes were counted by Coulter counter. Data are means ± SEM of 5 to 10 determinations. ∗, p < 0.05; ∗∗, p < 0.01. Collectively, our results indicate the involvement of FAN in leukocyte recruitment within the spleen enabling the establishment of a specific immune response toward a complex thymo- dependent Ag. The present study provides evidence, for the first time, that the TNF-R1 NSD and its associated adaptor protein FAN modulate TNF-induced gene expression, notably for genes encoding inflammatory proteins such as IL-6 and CXCL-2. Thus, TNF-mediated inflammatory gene expression is not restricted to the TNF-R1 death domain and associated proteins. For instance, TRADD has been implicated in the expression of some, but not all, inflammation-related gene products in response to TNF (37). Antisense oligonucleotide-mediated depletion of endogenous TRADD in HUVECs strongly altered TNF-induced expression of ICAM-1, while having a more limited, yet significant, effect on CXCL-2 expression (37). The molecular mechanism responsible for the attenuation of specific gene expression in FAN−/− cells is currently unclear. FAN has been described as being essential for TNF-mediated neutral sphingomyelinase activation. Both neutral sphingomyelinases 2 and 3 can be activated in TNF-R1 signaling (38, 39, 40, 41). So far, only neutral sphingomyelinase 3 activation has been proposed to be regulated by FAN (41), but its role in TNF-R1-mediated inflammation remains to be investigated. Recently, neutral sphingomyelinase 2 was reported to be involved in VCAM-1 and ICAM-1 expression upon TNF (38) and endothelial NO synthase activation (39). Ceramide and its metabolites, such as ceramide-1-phosphate and sphingosine-1-phosphate, are putative inflammatory mediators, able to stimulate the expression of inflammatory proteins, including cytokines and adhesion molecules (42). Thus, one can speculate that FAN participates in TNF-induced gene expression through its capacity to activate neutral sphingomyelinase and generate bioactive sphingolipids. In addition, FAN is required for TNF-mediated activation of cdc42, which likely regulates gene expression (43). Finally, interaction of FAN with RACK1 may activate other signaling pathways, including protein kinase C-dependent pathways, possibly leading to proinflammatory gene expression (44). The promoter regions of genes encoding IL-6 (45), CXCL-2 (46), and MCP-1 (47) display common regulatory DNA sequences (such as NF-κB, SP1, and AP-1 binding sites). However, IL-6, CXCL-2, and MCP-1 are not always simultaneously expressed and can be expressed at different levels, depending on the experimental conditions (48, 49). Accordingly, under our various experimental conditions, TNF triggered a robust expression of MCP-1 whereas IL-6 and CXCL-2 were expressed to a lesser extent both in vitro (Fig. 2⇑) and in vivo (Fig. 3⇑). Our data indicate that FAN-dependent signaling pathways are required for optimal TNF-induced IL-6 and CXCL-2 expression. One could postulate that FAN controls signaling pathways leading to the activation of transcription factors and/or cofactors. NF-κB and AP-1 are both major transcription factors involved in inflammation. Our laboratory, as well as others, has already shown that FAN is not directly required for TNF-induced activation of ERK, JNK, (16, 21, 50) and p38 MAPK (data not shown). In addition, TNF-mediated NF-κB translocation to the nucleus, as evaluated by gel shift, was not significantly altered in FAN−/− MEFs (data not shown). Transcription factors such as NF-κB cooperate with multiple coactivators to regulate gene expression (51). Data from our microarray analysis suggest a putative role for FAN in the expression of different transcription/nuclear factors such as C/EBPδ, RUNX1, and PARP9 (see http://www.ncbi.nlm.nih.gov/geo/query/acc.cgi?acc=GSE12275), which are likely involved in the regulation of TNF-induced gene transcription. For example, NF-κB and C/EBPδ are both known to be involved in IL-6 gene transcription (52). In addition, FAN may also contribute to signaling pathways that regulate mRNA stabilization. The role of FAN in TNF-induced gene expression appears to be selective. Indeed, some genes were equally up-regulated in FAN+/+ and FAN−/− fibroblasts. In contrast, FAN deficiency was accompanied by an alteration in the expression of a restricted set of genes (Table I⇑). Analysis by IPA software (Ingenuity Systems) of the biological functions associated with the genes from cluster 1 (i.e., exhibiting a FAN-dependent optimal expression in response to TNF) indicated that FAN is putatively involved in immunological disorders (p = 6 × 10−20) and inflammatory disorders (p = 1 × 10−17) rather than infectious disorders (p = 9 × 10−6). In addition, an IPA network analysis of genes from cluster 1 suggests that FAN plays a role in Ag presentation and the specific immune response (data not shown). Of particular interest is the finding that some genes from cluster 1, such as IL-6, CCL5, CCL9, CCL20, CXCL-2, and TNFSF11, are implicated in autoimmune diseases (p = 4 × 10−19). Thus, microarray analysis indicates the involvement of FAN in cytokine/chemokine expression and inflammation rather than anti-infectious responses. Accordingly, leukocyte recruitment induced by proinflammatory agents, including TNF (Fig. 3⇑) and thioglycollate (Fig. 4⇑), was significantly impaired in FAN−/− mice, whereas the anti-infectious response to different microorganisms remained unaffected by FAN deficiency (Fig. 5⇑). When mice were challenged with BSA emulsified in CFA, blood leukocyte content strongly increased in FAN+/+ and, albeit to a lesser extent, in FAN−/− mice. However, spleen leukocyte content did not significantly increase in FAN−/− mice, in sharp contrast to their FAN+/+ counterparts. Macrophages, neutrophils, dendritic cells, and lymphoid cells (essentially B-cells) were reduced in FAN−/− mice (Fig. 7⇑ and data not shown), indicating that the role of FAN in leukocyte recruitment is not limited to a single leukocyte population. Recently, evidence has been provided for the involvement of FAN in TNF-induced cdc42 activation and cytoskeleton modeling (15). The impairment of leukocyte recruitment in FAN−/− mice may result from an alteration of cytokine/chemokine expression by resident cells and/or a reduced leukocyte shape modification, limiting white cell migration to inflammatory sites. Before immunization, no differences were found in leukocyte content between the two mouse strains (Fig. 7⇑), in agreement with a previous report (21). This suggests that FAN does not play a crucial role in hematopoiesis and leukocyte tissue distribution under basal (i.e., noninflammatory) conditions. However, 10 days after the injection of BSA emulsified in CFA, there were fewer circulating monocytes in FAN−/− mice, while granulocyte and lymphoid cell blood contents remained similar. This finding suggests that FAN participates in central monocyte production and/or monocyte migration from the bone marrow to the circulation in an inflammatory context. Because MCP-1 plays an important role in monocyte emigration from bone marrow (53), FAN′s involvement in this phenomenon is unexpected. However, due to the complexity of the chemokine network and the existence of functional redundancy between chemokines (54), chemokines other than MCP-1 whose expression is FAN-dependent may also participate in leukocyte trafficking. Finally, because TNF (via its capacity to stimulate TNF-R1) and IL-6 are known regulators of hematopoiesis (55, 56), we cannot exclude the possibility that FAN contributes to central leukocyte production under proinflammatory conditions. Production of specific anti-BSA Abs was substantially reduced in FAN−/− mice as compared with FAN+/+ animals. The reduced humoral response in FAN−/− mice is unlikely an intrinsic defect of B cells because Ab production toward a thymo-independent Ag was not affected in FAN−/− mice (data not shown), and in vitro B cell proliferation triggered by anti-BCR Ab was equivalent in FAN−/− and FAN+/+ spleen cells (data not shown). Nevertheless, FAN deficiency reduced B cell proliferation induced either by CD40L or LPS by ∼20% (data not shown). Thus, in agreement with our previous studies (11, 20), FAN may physically and/or functionally interact with different receptors involved in immune response regulation, such as CD40 and TLR. Moreover, alteration of leukocyte recruitment to the spleen likely contributes to the reduced humoral response in FAN−/− animals. One of the major findings presented here is that FAN does not play a crucial role in the clearance of various pathogens, despite its role in leukocyte recruitment. Indeed, FAN−/− mice were not more susceptible to pathogens than FAN+/+ mice (Fig. 5⇑). In sharp contrast, TNF- and TNF-R1-deficient mice are highly susceptible to infection, most likely due to the essential role of TNF and TNF-R1 in the innate immune response by mediating, for instance, NO production as a consequence of inducible NO synthase expression, notably by macrophages (30, 31, 32, 33, 57). Thus, our data strongly suggest that FAN is not essential in this pathway and in the innate immune response to microorganisms. Collectively, our data strongly indicate that FAN regulates leukocyte recruitment to inflammatory sites, contributes to specific immune responses, and does not play an essential role in innate anti-infectious responses, which are known to be primarily mediated by TNF. Because anti-TNF therapy in autoimmune diseases is associated with enhanced susceptibility to infection, it is tempting to speculate that FAN and/or downstream signaling pathways may constitute potential therapeutic target(s) to attenuate leukocyte recruitment and, in turn, abrogate the deleterious inflammatory effects, without affecting the TNF-dependent anti-infectious response. We are grateful to Drs. S. Adam-Klages and M. Krönke (Kiel, Germany) for providing FAN+/− embryos. We thank Dr. S. Schütze (Kiel, Germany) for giving wild-type and NSD-deleted TNF-R1 MEFs, and Dr. J. F. Arnal (Toulouse, France) for the gift of TNF-deficient mice. We thank P. Clavé, M. F. Altié, C. Fourreau, R. Dupont, and J. C. Lepert for excellent technical assistance. ↵1 This study was supported by INSERM, Paul Sabatier University, Génopôle Toulouse-Midi-Pyrénées, Grant 3417 from the Association pour la Recherche sur le Cancer (to B.S.). ↵3 Abbreviations used in this paper: TRADD, TNF-R1-associated protein with death domain; cdc42, cell division cycle 42; FAN, factor associated with neutral sphingomyelinase activation; FAN DN, dominant-negative FAN; IFA, incomplete Freund’s adjuvant; IPA, Ingenuity Pathways Analysis; MEF, mouse embryonic fibroblast; NSD, neutral sphingomyelinase domain. Mannel, D. N., B. Echtenacher. 2000. TNF in the inflammatory response. Chem. Immunol. 74: 141-161. Gatto, B.. 2006. Biologics targeted at TNF: design, production and challenges. Reumatismo 58: 94-103. Hasegawa, A., W. Takasaki, M. I. Greene, R. Murali. 2001. Modifying TNFα for therapeutic use: a perspective on the TNF receptor system. Mini Rev. Med. Chem. 1: 5-16. Bradley, J. R.. 2008. TNF-mediated inflammatory disease. J. Pathol. 214: 149-160. Hsu, H., H. B. Shu, M. G. Pan, D. V. Goeddel. 1996. TRADD-TRAF2 and TRADD-FADD interactions define two distinct TNF receptor 1 signal transduction pathways. Cell 84: 299-308. Wajant, H., K. Pfizenmaier, P. Scheurich. 2003. Tumor necrosis factor signaling. Cell Death Differ. 10: 45-65. Muzio, M., A. M. Chinnaiyan, F. C. Kischkel, K. O'Rourke, A. Shevchenko, J. Ni, C. Scaffidi, J. D. Bretz, M. Zhang, R. Gentz, et al 1996. FLICE, a novel FADD-homologous ICE/CED-3-like protease, is recruited to the CD95 (Fas/APO-1) death–inducing signaling complex. Cell 85: 817-827. Adam, D., K. Wiegmann, S. Adam-Klages, A. Ruff, M. Krönke. 1996. A novel cytoplasmic domain of the p55 tumor necrosis factor receptor initiates the neutral sphingomyelinase pathway. J. Biol. Chem. 271: 14617-14622. Adam-Klages, S., D. Adam, K. Wiegmann, S. Struve, W. Kolanus, J. Schneider-Mergener, M. Kronke. 1996. FAN, a novel WD-repeat protein, couples the p55 TNF-receptor to neutral sphingomyelinase. Cell 86: 937-947. Segui, B., N. Andrieu-Abadie, S. Adam-Klages, O. Meilhac, D. Kreder, V. Garcia, A. P. Bruno, J. P. Jaffrezou, R. Salvayre, M. Kronke, T. Levade. 1999. CD40 signals apoptosis through FAN-regulated activation of the sphingomyelin-ceramide pathway. J. Biol. Chem. 274: 37251-37258. Sanchez, C., D. Rueda, B. Segui, I. Galve-Roperh, T. Levade, M. Guzman. 2001. The CB(1) cannabinoid receptor of astrocytes is coupled to sphingomyelin hydrolysis through the adaptor protein fan. Mol. Pharmacol. 59: 955-959. Jogl, G., Y. Shen, D. Gebauer, J. Li, K. Wiegmann, H. Kashkar, M. Kronke, L. Tong. 2002. Crystal structure of the BEACH domain reveals an unusual fold and extensive association with a novel PH domain. EMBO J. 21: 4785-4795. Tcherkasowa, A. E., S. Adam-Klages, M. L. Kruse, K. Wiegmann, S. Mathieu, W. Kolanus, M. Kronke, D. Adam. 2002. Interaction with factor associated with neutral sphingomyelinase activation, a WD motif-containing protein, identifies receptor for activated C-kinase 1 as a novel component of the signaling pathways of the p55 TNF receptor. J. Immunol. 169: 5161-5170. Haubert, D., N. Gharib, F. Rivero, K. Wiegmann, M. Hosel, M. Krönke, H. Kashkar. 2007. PtdIns(4,5)P-restricted plasma membrane localization of FAN is involved in TNF-induced actin reorganization. EMBO J. 26: 3308-3321. Segui, B., O. Cuvillier, S. Adam-Klages, V. Garcia, S. Malagarie-Cazenave, S. Leveque, S. Caspar-Bauguil, J. Coudert, R. Salvayre, M. Kronke, T. Levade. 2001. Involvement of FAN in TNF-induced apoptosis. J. Clin. Invest. 108: 143-151. Werneburg, N., M. E. Guicciardi, X. M. Yin, G. J. Gores. TNF-α-mediated lysosomal permeabilization is FAN and caspase 8/Bid dependent. Am. J. Physiol. Gastrointest. Liver Physiol. 287: G436-G443. O'Brien, N. W., N. M. Gellings, M. Guo, S. B. Barlow, C. C. Glembotski, R. A. Sabbadini. 2003. Factor associated with neutral sphingomyelinase activation and its role in cardiac cell death. Circ. Res. 92: 589-591. Mohlig, H., S. Mathieu, L. Thon, M. C. Frederiksen, D. M. Ward, J. Kaplan, S. Schutze, D. Kabelitz, D. Adam. 2007. The WD repeat protein FAN regulates lysosome size independent from abnormal downregulation/membrane recruitment of protein kinase C. Exp. Cell Res. 313: 2703-2718. Malagarie-Cazenave, S., B. Segui, S. Leveque, V. Garcia, S. Carpentier, M. F. Altie, A. Brouchet, V. Gouaze, N. Andrieu-Abadie, Y. Barreira, H. Benoist, T. Levade. 2004. Role of FAN in tumor necrosis factor-α and lipopolysaccharide-induced interleukin-6 secretion and lethality in D-galactosamine-sensitized mice. J. Biol. Chem. 279: 18648-18655. Kreder, D., O. Krut, S. Adam-Klages, K. Wiegmann, G. Scherer, T. Plitz, J. M. Jensen, E. Proksch, J. Steinmann, K. Pfeffer, M. Krönke. 1999. Impaired neutral sphingomyelinase activation and cutaneous barrier repair in FAN-deficient mice. EMBO J. 18: 2472-2479. Palin, K., R. M. Bluthe, R. H. McCusker, T. Levade, F. Moos, R. Dantzer, K. W. Kelley. 2009. The type 1 TNF receptor and its associated adapter protein, FAN, are required for TNFα-induced sickness behavior. Psychopharmacology 201: 549-556. Neumeyer, J., C. Hallas, O. Merkel, S. Winoto-Morbach, M. Jakob, L. Thon, D. Adam, W. Schneider-Brachert, S. Schutze. 2006. TNF-receptor I defective in internalization allows for cell death through activation of neutral sphingomyelinase. Exp. Cell Res. 312: 2142-2153. Beverley, J. K.. 1959. Congenital transmission of toxoplasmosis through successive generations of mice. Nature 183: 1348-1349. Echenique, J., A. Kadioglu, S. Romao, P. W. Andrew, M. C. Trombe. 2004. Protein serine/threonine kinase StkP positively controls virulence and competence in Streptococcus pneumoniae. Infect. Immun. 72: 2434-2437. Edgar, R., M. Domrachev, A. E. Lash. 2002. Gene Expression Omnibus: NCBI gene expression and hybridization array data repository. Nucleic Acids Res. 30: 207-210. Boucher, J., B. Masri, D. Daviaud, S. Gesta, C. Guigne, A. Mazzucotelli, I. Castan-Laurell, I. Tack, B. Knibiehler, C. Carpene, et al 2005. Apelin, a newly identified adipokine up-regulated by insulin and obesity. Endocrinology 146: 1764-1771. Raichel, L., S. Berger, N. Hadad, L. Kachko, M. Karter, I. Szaingurten-Solodkin, R. O. Williams, M. Feldmann, R. Levy. 2008. Reduction of cPLA2α overexpression: an efficient anti-inflammatory therapy for collagen-induced arthritis. Eur. J. Immunol. 38: 2905-2915. White, P., S. A. Liebhaber, N. E. Cooke. 2002. 129×1/SvJ mouse strain has a novel defect in inflammatory cell recruitment. J. Immunol. 168: 869-874. Schluter, D., L. Y. Kwok, S. Lutjen, S. Soltek, S. Hoffmann, H. Korner, M. Deckert. 2003. Both lymphotoxin-α and TNF are crucial for control of Toxoplasma gondii in the central nervous system. J. Immunol. 170: 6172-6182. Deckert-Schluter, M., H. Bluethmann, A. Rang, H. Hof, D. Schluter. 1998. Crucial role of TNF receptor type 1 (p55), but not of TNF receptor type 2 (p75), in murine toxoplasmosis. J. Immunol. 160: 3427-3436. O'Brien, D. P., D. E. Briles, A. J. Szalai, A. H. Tu, I. Sanz, M. H. Nahm. 1999. Tumor necrosis factor α receptor I is important for survival from Streptococcus pneumoniae infections. Infect. Immun. 67: 595-601. Le Hir, M., H. Bluethmann, M. H. Kosco-Vilbois, M. Muller, F. di Padova, M. Moore, B. Ryffel, H. P. Eugster. 1996. Differentiation of follicular dendritic cells and full antibody responses require tumor necrosis factor receptor-1 signaling. J. Exp. Med. 183: 2367-2372. Le Hir, M., H. Bluethmann, M. H. Kosco-Vilbois, M. Muller, F. di Padova, M. Moore, B. Ryffel, H. P. Eugster. 1995. Tumor necrosis factor receptor-1 signaling is required for differentiation of follicular dendritic cells, germinal center formation, and full antibody responses. J. Inflamm. 47: 76-80. Pasparakis, M., L. Alexopoulou, V. Episkopou, G. Kollias. 1996. Immune and inflammatory responses in TNF α-deficient mice: a critical requirement for TNFα in the formation of primary B cell follicles, follicular dendritic cell networks and germinal centers, and in the maturation of the humoral immune response. J. Exp. Med. 184: 1397-1411. Siwkowski, A. M., L. A. Madge, S. Koo, E. L. McMillan, B. P. Monia, J. S. Pober, B. F. Baker. 2004. Effects of antisense oligonucleotide-mediated depletion of tumor necrosis factor (TNF) receptor 1-associated death domain protein on TNF-induced gene expression. Mol. Pharmacol. 66: 572-579. Clarke, C. J., T. G. Truong, Y. A. Hannun. 2007. Role for neutral sphingomyelinase-2 in tumor necrosis factor α-stimulated expression of vascular cell adhesion molecule-1 (VCAM) and intercellular adhesion molecule-1 (ICAM) in lung epithelial cells: p38 MAPK is an upstream regulator of nSMase2. J. Biol. Chem. 282: 1384-1396. De Palma, C., E. Meacci, C. Perrotta, P. Bruni, E. Clementi. 2006. Endothelial nitric oxide synthase activation by tumor necrosis factor α through neutral sphingomyelinase 2, sphingosine kinase 1, and sphingosine 1 phosphate receptors: a novel pathway relevant to the pathophysiology of endothelium. Arterioscler. Thromb. Vasc. Biol. 26: 99-105. Aubin, I., C. P. Adams, S. Opsahl, D. Septier, C. E. Bishop, N. Auge, R. Salvayre, A. Negre-Salvayre, M. Goldberg, J. L. Guenet, C. Poirier. 2005. A deletion in the gene encoding sphingomyelin phosphodiesterase 3 (Smpd3) results in osteogenesis and dentinogenesis imperfecta in the mouse. Nat. Genet. 37: 803-805. Krut, O., K. Wiegmann, H. Kashkar, B. Yazdanpanah, M. Krönke. 2006. Novel tumor necrosis factor-responsive mammalian neutral sphingomyelinase-3 is a C-tail-anchored protein. J. Biol. Chem. 281: 13784-13793. Hannun, Y. A., L. M. Obeid. 2008. Principles of bioactive lipid signalling: lessons from sphingolipids. Nat. Rev. Mol. Cell Biol. 9: 139-150. Min, W., J. S. Pober. 1997. TNF initiates E-selectin transcription in human endothelial cells through parallel TRAF-NF-κB and TRAF-RAC/CDC42-JNK-c-Jun/ATF2 pathways. J. Immunol. 159: 3508-3518. Kontny, E., M. Ziolkowska, A. Ryzewska, W. Maslinski. 1999. Protein kinase c-dependent pathway is critical for the production of pro-inflammatory cytokines (TNF-α. IL-1β, IL-6). Cytokine 11: 839-848. Tanabe, O., S. Akira, T. Kamiya, G. G. Wong, T. Hirano, T. Kishimoto. 1988. Genomic structure of the murine IL-6 gene: high degree conservation of potential regulatory sequences between mouse and human. J. Immunol. 141: 3875-3881. Widmer, U., K. R. Manogue, A. Cerami, B. Sherry. 1993. Genomic cloning and promoter analysis of macrophage inflammatory protein (MIP)-2, MIP-1α, and MIP-1β, members of the chemokine superfamily of proinflammatory cytokines. J. Immunol. 150: 4996-5012. Ping, D., P. L. Jones, J. M. Boss. 1996. TNF regulates the in vivo occupancy of both distal and proximal regulatory regions of the MCP-1/JE gene. Immunity 4: 455-469. Flesch, I. E., J. Barsig, S. H. Kaufmann. 1998. Differential chemokine response of murine macrophages stimulated with cytokines and infected with Listeria monocytogenes. Int. Immunol. 10: 757-765. Hartner, A., M. Goppelt-Struebe, G. M. Hocke, R. B. Sterzel. 1997. Differential regulation of chemokines by leukemia inhibitory factor, interleukin-6 and oncostatin M. Kidney Int. 51: 1754-1760. Luschen, S., D. Adam, S. Ussat, D. Kreder, W. Schneider-Brachert, M. Kronke, S. Adam-Klages. 2000. Activation of ERK1/2 and cPLA(2) by the p55 TNF receptor occurs independently of FAN. Biochem. Biophys. Res. Commun. 274: 506-512. Sheppard, K. A., D. W. Rose, Z. K. Haque, R. Kurokawa, E. McInerney, S. Westin, D. Thanos, M. G. Rosenfeld, C. K. Glass, T. Collins. 1999. Transcriptional activation by NF-κB requires multiple coactivators. Mol. Cell Biol. 19: 6367-6378. Vanden Berghe, W., L. Vermeulen, G. De Wilde, K. De Bosscher, E. Boone, G. Haegeman. 2000. Signal transduction by tumor necrosis factor and gene regulation of the inflammatory cytokine interleukin-6. Biochem. Pharmacol. 60: 1185-1195. Jia, T., N. V. Serbina, K. Brandl, M. X. Zhong, I. M. Leiner, I. F. Charo, E. G. Pamer. 2008. Additive roles for MCP-1 and MCP-3 in CCR2-mediated recruitment of inflammatory monocytes during Listeria monocytogenes infection. J. Immunol. 180: 6846-6853. Rossi, D., A. Zlotnik. 2000. The biology of chemokines and their receptors. Annu. Rev. Immunol. 18: 217-242. Rodriguez Mdel, C., A. Bernad, M. Aracil. 2004. Interleukin-6 deficiency affects bone marrow stromal precursors, resulting in defective hematopoietic support. Blood 103: 3349-3354. Zhang, Y., A. Harada, H. Bluethmann, J. B. Wang, S. Nakao, N. Mukaida, K. Matsushima. 1995. 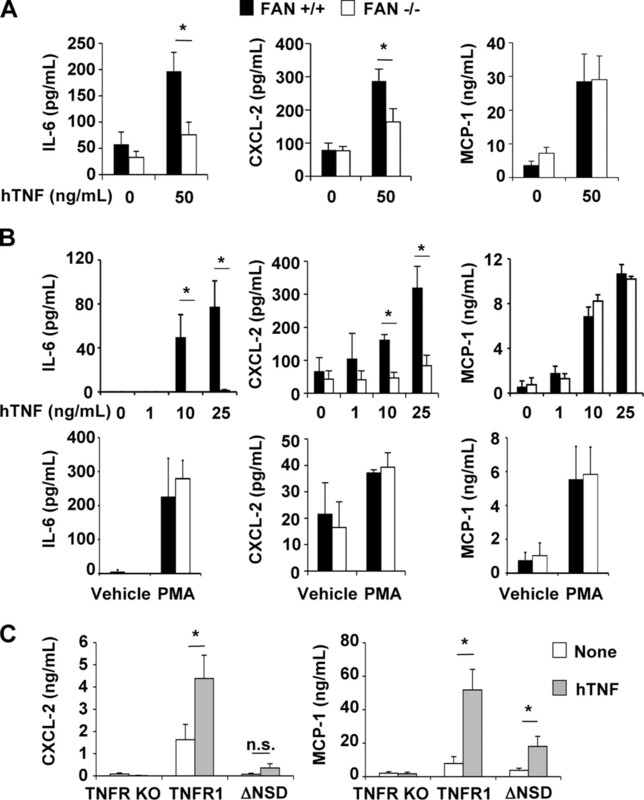 Tumor necrosis factor (TNF) is a physiologic regulator of hematopoietic progenitor cells: increase of early hematopoietic progenitor cells in TNF receptor p55-deficient mice in vivo and potent inhibition of progenitor cell proliferation by TNFα in vitro. Blood 86: 2930-2937.